One of the Russian destroyers engaged in the Anti-Submarine Warfare (ASW) exercise in the Barents Sea. Photo: Russian defence ministry. Heavy-hitting reinforcements for US Navy forces in the Mediterranean have now arrived, with the USS Harry S. Truman Carrier Strike Group (HSTCSG) and her powerful array of warships completing the trans-Atlantic crossing in just over a week. 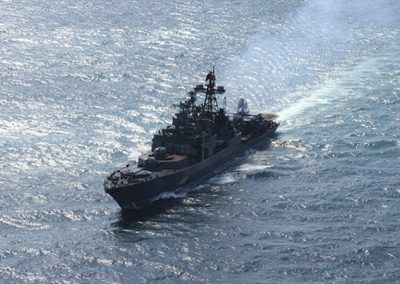 They join US Navy’s Sixth Fleet area of operations (AOR) at a time of continuing high tension between Russia and the West. The entry of the Harry S. Truman comes less than a week after bombardment of suspected chemical weapons sites in Syria by US Navy surface warships and a submarine, along with a French frigate – all firing cruise missiles – in tandem with air strikes by jet fighters from the USA, France and the UK. Within days of the Syria strikes, the Kremlin deployed an Anti-submarine Warfare (ASW) ‘search-and-strike group’, as the Russian Navy termed it, from the Northern Fleet in the Arctic. The destroyers Severomorsk and Vice Admiral Kulakov (both Udaloy I Class ships) were, according to the Russians, in the Barents Sea conducting a ‘test tactical drill on searching for and destroying’ what was further described as a ‘simulated enemy submarine’. The guided-missile destroyer USS Forrest Sherman launches a Standard Missile 2 (SM2) from the aft missile deck during a live firing exercise as the USS Harry S. Truman Carrier Strike Group (HSTCSG) heads for the Mediterranean. Photo: US Navy. However, it was not beyond the bounds of possibility that the Russian exercise was in reality a means to sanitise exit routes for Russian submarines being deployed to go and shadow the Harry S. Truman and her battle group. If this was the case, Russian attack submarines would also have been deployed to ‘delouse’ waters off the main naval bases in the Kola Peninsula, to counter any NATO submarines snooping around – although one of them could not be the British hunter-killer boat HMS Trenchant. Following her dramatic exploits alongside American submarines in the Arctic, surfacing through polar ice, the Trafalgar Class SSN this week sailed into Submarine Base New London, on the east coast of the USA, for a port visit. See the latest edition of WARSHIPS IFR for a report and stunning imagery of HMS Trenchant and US Navy submarines during ICEX 2018. 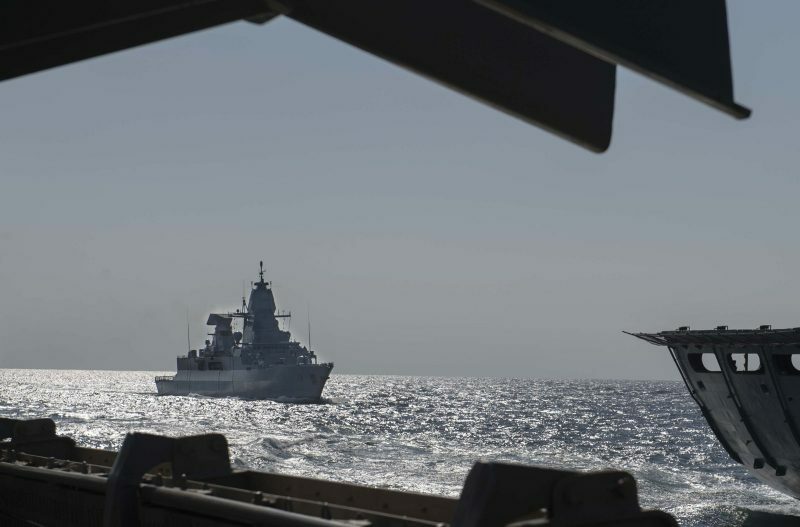 Scheduled to last several days, the Russian ASW exercise in the Barents was due to also involve ‘tasks of engaging the simulated submarine enemy,’ according to the Russian defence ministry. It also advised that its ASW warships would ‘conduct torpedo firing with practical ammunition.’ During the old Cold War between Russia and the West this might have been considered convenient cover for the pursuit of a NATO submarine on surveillance mission in the Barents. As the carrier approaches European waters, aboard the USS Harry S. Truman strike jets are taken down from the flight-deck to the hangar bay. Photo: US Navy. As the Russian ASW ‘exercise’ got underway in the Arctic, a highly significant face-to-face meeting was being held in Baku, Azerbaijan, between NATO’s current Supreme Allied Commander Europe, US Army General Curtis Scaparrotti and the Chief of the General Staff of the Russian Armed Forces, General of the Army Valery Gerasimov. The neutral ground summit was called to discuss relations between NATO and Russia, but was surely also a means to ensure Moscow’s military and those of Western nations do not clash in any future episodes in which weaponry is unleashed to against Syrian targets. A Russian defence ministry account explained: ‘They also exchanged views on the situation in Syria, stressing the necessity of cooperation in fighting against international terrorism.’ For the Russians the latter group does not include President Assad’s regime in Syria, however. With more and more firepower being concentrated in the Mediterranean by the US Navy – and with inflammatory tweets potentially fired off by President Trump and Russia’s social media warfare operatives hitting back – the need for military-to-military understanding and back channels of co-operation is essential. It will aim to prevent the situation spinning out of control into a potentially catastrophic clash between Moscow’s forces and those of America and its allies. This could soon morph into something much more serious, especially under the Russian doctrine of ‘escalate to de-escalate’, which sees Moscow, potentially, swiftly threatening use of nuclear weapons to make a foe back off. Prior to last weekend’s bombardment of Syrian targets there were allegedly phone conversations between American and Russian military representatives, to ensure none of the strikes hit places where Russians might be killed or injured. Should the USA and its allies think further strikes necessary, the means to now conduct a broader and more intensive attack are now moving into place. The Harry S. Truman CSG currently includes the Sachsen Class frigate FGS Hessen of the German Navy, which, according to the US Navy, ‘is also operating as part of the strike group during the initial portion of the deployment.’ With neither Germany nor NATO part of the previous military action against the Syrian regime, any further strikes launched from the sea are likely to see the Hessen disconnect herself from the CSG, though she probably will not sail with it to the eastern Mediterranean anyway. 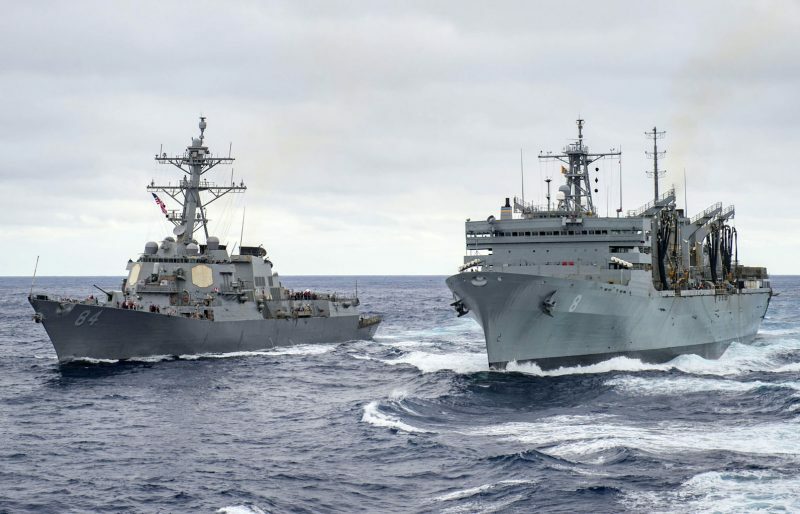 In addition to USS Harry S. Truman herself – with four jet squadrons plus supporting units, including Airborne Early Warning (AEW) aircraft, Electronic Warfare (EW) jets and helicopters – the newly arrived CSG includes the following escorting ships (which are strike units in themselves): USS Normandy (guided-missile cruiser); USS Farragut, USS Forrest Sherman, USS Bulkeley and USS Arleigh Burke (guided-missile destroyers). Supported also by fleet replenishment ships, according to US Navy sources the Truman CSG will soon also be joined by two more destroyers armed with Tomahawk Land Attack Missiles (TLAM), in the shape of USS Jason Dunham and USS The Sullivans. That does not, in fact, encompass the entirety of American naval power currently available in northern European waters and the Mediterranean, while vessels deployed in the Red Sea and Arabian Gulf are presumably still within range of Syrian targets. 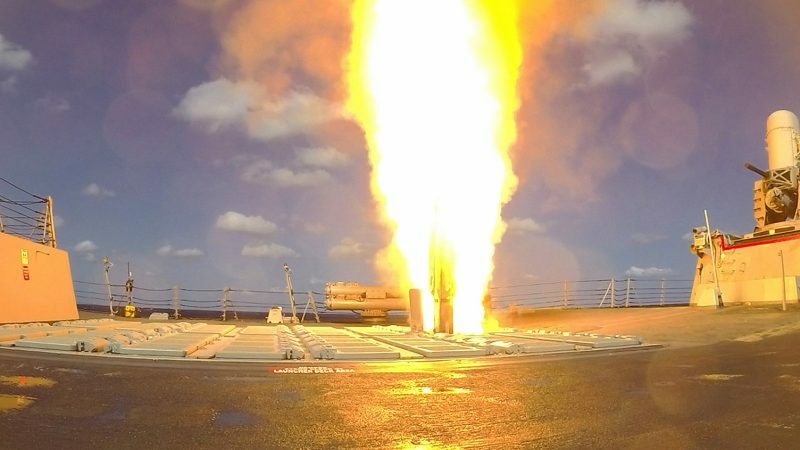 The HSTCSG is no stranger to operations in the US 6th Fleet AOR, having been sent there to conduct strikes on ISIL targets in Syria in the summer of 2016. The last US Navy CSG to see action in the eastern Mediterranean was spearheaded by USS George H. W. Bush, in the summer of 2017. 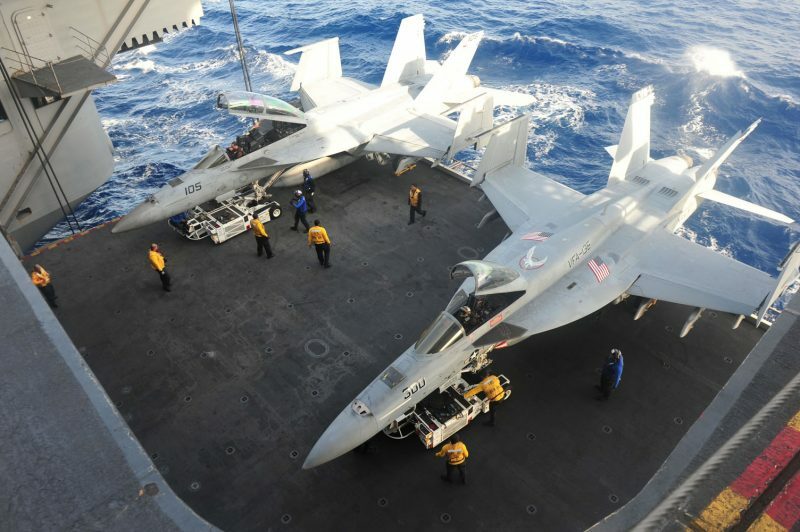 The US Navy has in the past frequently had a strike carrier in the neighbouring 5th Fleet AOR – covering waters off Arabia – but at the time of last weekend’s strikes on Syria, the assigned ship, USS Theodore Roosevelt, was in the South China Sea, another zone of increased tension at sea. The guided-missile destroyer USS Bulkeley conducts a Replenishment-at-Sea (RAS) with USNS Arctic as both vessels head across the Atlantic with the USS Harry S. Truman Carrier Strike Group (HSTCSG). Photo: US Navy. News, analysis and commentary of the Syrian attacks, along with their aftermath from a maritime perspective and other global naval developments is available via WARSHIPS IFR with more coverage to come in the hard copy version of the magazine (June 2018 edition, out 18 May). The latest edition (May 2018) is now out and includes a look at the formidable new weapons being created by order of President Putin to try and cow the West, along with reports and pictures from a recent major Anti-submarine Warfare exercise staged by NATO in the Mediterranean. More on the undersea and surface navy face-off between Russia and the West in recent years and during the Cold War is to be found in WARSHIPS IFR Editor Iain Ballantyne’s recently published book ‘THE DEADLY TRADE: The Complete History of Submarine Warfare from Archimedes to the Present’, published by Weidenfeld & Nicolson (752 pages, hardback £25.00/eBook £12.99) http://iainballantyne.com/the-deadly-trade/ which is available via Amazon, Waterstones and other retailers and shops.